FALLS CHURCH, VA--(Marketwired - April 21, 2017) - Community Associations Institute (CAI), the leading international authority in community association education, governance, and management, will host the 2017 Annual Conference and Exposition, May 3-6 at Caesars Palace in Las Vegas. This annual event brings together nearly 2,000 community association homeowners, managers, management company executives, association board members, and business professionals serving the 338,000 condominium, co-ops, and community associations in the U.S. and millions more worldwide. The three-day conference kicks off with keynote speakers Laura Stack and Steve Gilliland and includes more than 30 education sessions. CAI's conference is an opportunity for industry leaders to gather, share ideas, and network with community association peers from around the world. This year's exhibit hall will also feature the largest international community association show in the world. Continuing its tradition as the premier marketplace for sharing ideas and showcasing cutting-edge information services, the CAI exposition hall features more than 160 companies and professional services that support community association living. Community association professionals representing more than 10 countries including Australia, Canada, Japan, New Zealand, Spain, South Africa, and United Arab Emirates will be in attendance. On Wed., May 3, delegates from outside of the U.S. will tour a Las Vegas high-rise condominium, Panorama Towers and Taylor Management, a professional community management services company. During the conference, the World Congress on Community Association Management, which unites international standards of management excellence and best practices convenes to network and discuss education and management values. "As the premier organization for community association living, CAI's Annual Conference and Exposition is the best learning and networking event available for today's community association homeowners, community managers, and the professional businesses that serve these communities," said Thomas M. Skiba, CAE, CAI's chief executive officer. "As we witness the tremendous growth of community associations worldwide it is necessary to have an annual event where industry leaders can gather under one roof to explore the latest trends and challenges impacting today's condominiums, homeowners associations, and co-ops. Our attendees leave our conference armed with the critical education, information, and networking experience to better serve the homeowners of today and tomorrow." Registration for the event is open to both CAI members and nonmembers. For online registration, visit www.caionline.org/events. 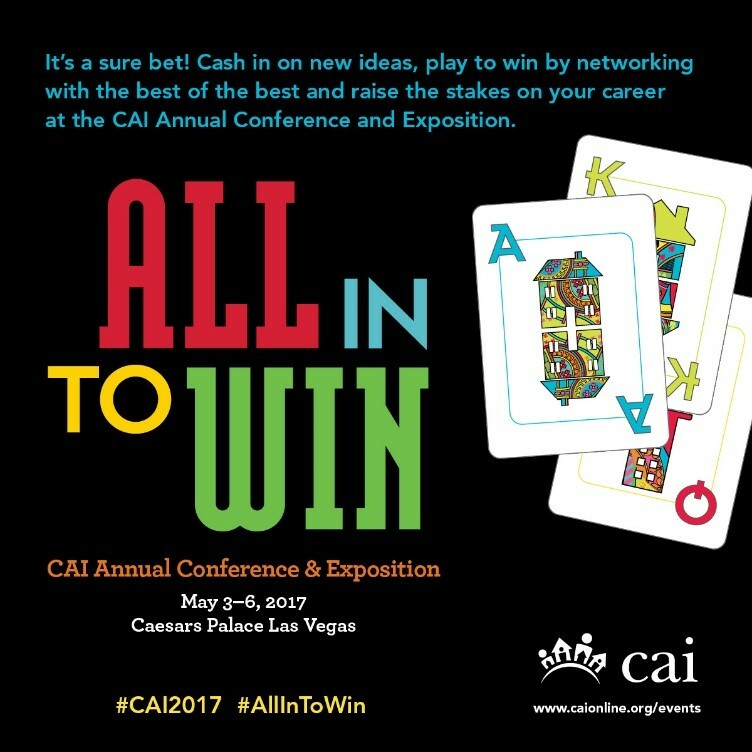 Follow the Conference hashtag, #CAI2017, to take part in the conversation. Since 1973, Community Associations Institute (CAI) has been the leading provider of resources and information for homeowners, volunteer board leaders, professional managers, and business professionals in more than 338,000 community associations, condominiums, and co-ops in the United States and millions of communities worldwide. With more than 34,000 members, CAI works in partnership with 62 affiliated chapters within the U.S., Canada, and South Africa, as well as with housing leaders in a number of countries including Australia, Spain, Saudi Arabia, United Arab Emirates, and the United Kingdom. A global nonprofit 501(c)(6) organization, CAI is the foremost authority in community association management, governance, education, and advocacy. Our mission is to inspire professionalism, effective leadership, and responsible citizenship -- ideals reflected in community associations that are preferred places to call home. Visit us at www.caionline.org and follow us on Twitter and Facebook @CAISocial.